Welcome to South Africa and to our beautiful economic hub, Johannesburg. The 17th Conference of the Parties to CITES is this year being held at a time when debate is raging, not only at government level, but in society in general, about the mechanisms in place to end the illegal wildlife trade. It is also being held at a time when countries are concerned about securing the livelihoods of people living with wildlife and ensuring communities are considered in terms of interventions implemented in terms of this Convention. During the coming two weeks, you, as representatives of the Parties to the CITES Treaty, will consider a variety of issues, including the legal and sustainable wildlife trade, and steps to tackle illegal wildlife trafficking, such as fighting corruption, enhancing enforcement, encouraging demand reduction and supporting local livelihoods. African countries, through their participation in the Conference, have the potential to influence the negotiations and ensure that priorities such as the illegal wildlife trade are addressed. South Africa has a proud conservation track record. Through our sustainable conservation practices, we have brought species such as the rhino, the Mountain Zebra, and even sub-species of Elephant – the Addo Elephant – back from the brink of extinction. I hope that you will take the opportunity during CoP17 to experience some of our country’s rich cultural and natural heritage, our rich biodiversity and successful sustainable use management practices. Our commitment to the sustainable utilisation of natural resources contributes significantly to socio-economic development of poor and rural communities as part of our country’s economic and social development. As you deliberate on important issues, I hope that you will work towards a CoP that results in the adoption of proposals based on the listing criteria and sound scientific information that will ensure international trade in endangered species will be regulated in a manner that ensures there is no detrimental impact on the survival of the species in the wild. South Africa would like to see a CoP that results in resolutions that will improve the common interpretation of the Convention or the application of its provisions; thereby guiding Parties further on the implementation of the Convention. I am also hopeful that decisions will be reached that direct or instruct Parties and the various committees of the Convention to address key and emerging issues that require specific actions during the inter-sessional period. South Africa needs the Parties to the Convention to agree on measures and actions to be implemented within the mandate of the Convention to ensure legal international trade remains sustainable and illegal trade is eradicated. We would like the world to note and acknowledge that we do not tolerate illegal trade, and that we, as Parties to CITES, have taken, and continue to, take strong action against the perpetrators of these heinous crimes. South Africa has proposed a resolution on illegal international trade in wildlife which highlights the need for international cooperation, the sharing of best practices and enforcement resources, and the mobilisation of funds for sustainable interventions in order to combat illegal wildlife trade in CITES listed species, while emphasising the important role played by local communities. This CoP should recognise that people need to benefit from the sustainable utilisation of natural resources, including from legal international trade. We have also proposed a resolution on hunting trophies which seeks to clarify the uniform interpretation of the Convention with regards to hunting trophies, while emphasising the contribution of hunting to conservation, socio-economic beneficiation and to provide incentives for people to conserve wildlife. On Thursday, the 7th People and Parks Conference ended in Midrand. There delegates adopted the Midrand Declaration committing partners to, amongst others, work together to harmonise relations between people and nature; thereby unlocking the economic potential of protected areas for the benefit of adjacent communities in South Africa. 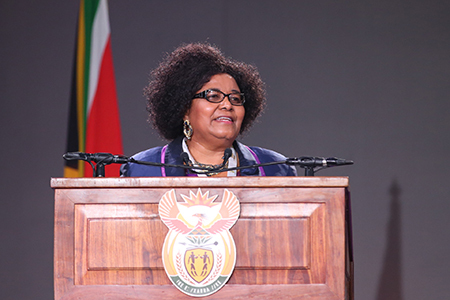 In line with the commitment to improve the lives of our people, South Africa has submitted a document to CITES -- Empowering the next generation: CITES and Youth Engagement for consideration. This is a report of the Youth Forum on People and Wildlife and the Youth Conservation Programme that South Africa is developing. It recognises the important role that the youth plays in conservation and aims to mobilise youth around conservation stressing the importance of every individual in the protection of South Africa’s natural wealth, while simultaneously highlighting the possibilities for the social economic upliftment through conservation. Ladies and Gentlemen, this CoP is also Green. We have taken additional steps to limit and, where possible, mitigate the environmental impacts associated with the Conference of the Parties. I therefore call on all participants to contribute in any way you can to the Greening of this CoP. Last, but not least, South Africa is delighted to use this opportunity to market our beautiful country! If you visit SA Tourisms website (www.southafrica.net), you will find, among others, Top 10 reasons to visit South Africa, the third most mega-biodiverse country in the world. Affordability is off course important to mention, but there are so many other reasons why people should find the time to explore South Africa before or after the Conference. We hope that everyone attending the CoP will be able to experience South Africa’s ultimate combination of nature, wildlife, culture, adventure, heritage and vibe! And while here, they could also use the opportunity to visit the other wonderful countries in Africa.